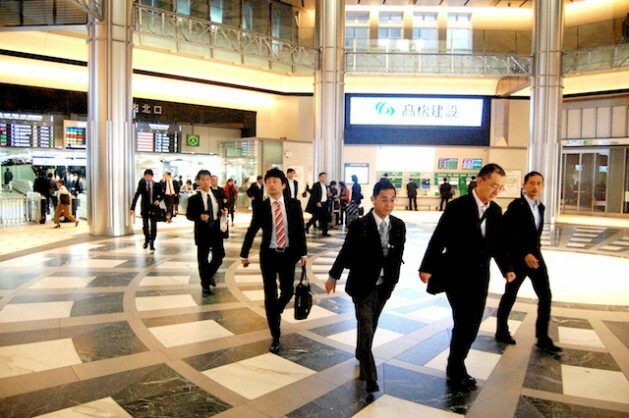 Japanese men heading to work - they continue to dominate work space, Credit: Daan Bauwens/IPS. TOKYO, Jan 31 2013 (IPS) - Despite anti-discrimination laws and a steadily growing number of employed women, Japan is falling behind the rest of the world on gender equality. Widespread discrimination persists, and has only grown more subtle over the past years. Japan is one of the world’s most industrialised countries but has always kept true to its old traditions. In the same way, traditional gender roles have always been a source of inequality in the world’s third largest economy. According to the United Nations Development Programme, Japan has consistently ranked as the most unequal of the world’s richest countries. And the gap seems to be widening: last October the World Economic Forum’s annual report on gender gaps downgraded Japan’s rank from 99 to 101, alongside Tajikistan and Gambia in terms of political and social equality. “After raising their children, it is very difficult for many women to come back,” says Kathy Matsui, a macro economist at one of Japan’s largest banks who has been studying employment of Japanese women since 1999. Discrimination is deeply engrained into the country’s institutions. “Japan has got numerous anti-discrimination laws,” says Yoshiyuki Takeuchi, professor of economy at the University of Osaka, “but still tax, pension, social security and health insurance are based on the model of a four-person family with a working father and a stay-at-home mother. At the same time, Japan’s economic reality is changing very rapidly. The country is deeply troubled by economic stagnation that started 20 years ago. The population is aging very rapidly, the birth rate is declining, and the country’s population is projected to shrink by around 30 percent by 2055. However, Japanese society doesn’t seem very willing to accept the idea. A poll conducted by the Japanese government in December showed that 51 percent of the population thinks women should stay at home and care for the family while their husbands work. That was 10.3 percent more than the view in a similar survey in 2009. The increase was particularly noticeable in the age category 20 to 30. Seems like they’re following past traditions.